Mix lime juice, garlic, and olive oil in a glass bowl. Add tilapia and marinate in refrigerator for one hour. Place tilapia in a glass baking dish surrounded by green and red bell peppers, minced cilantro, and tomatoes. Bake at 350°F for 10 minutes or until fish flakes easily. 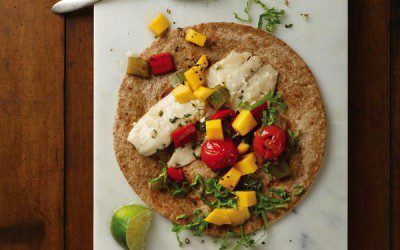 Divide fish and veggies into four servings and place on each of the warmed tortillas. Top with lettuce, cubed mango, and a sprinkling of black pepper. Exchanges per serving: 1 starch, 1/2 fruit, 1 vegetable, 3 lean meat. Image and recipe provided courtesy of Charles Mattocks.